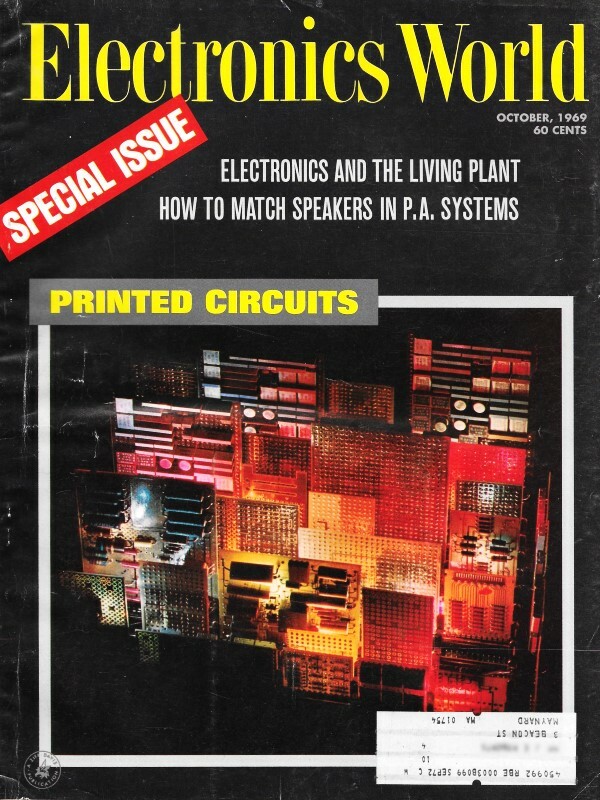 Printed circuit boards (PCBs), especially high density and many layered, were still a relatively new technology in 1969. Point-to-point wiring was still a large part of most products in the commercial, military, industrial, and aerospace worlds. Producing artwork and contracting for a lot of PCBs was rather expensive, especially in small quantities. Many people, including me, made quite a few single- and two-sided boards using photoresist pens and self-adhesive tape and pads, then bathing them in an etchant solution of ferric chloride. Through holes were made on a drill press and then traces and pads were tinned with flux and solder laid down on all exposed copper. Pseudo plated through holes were made with short pieces of bare wire running through the top-to-bottom holes and clinched down to the pads. Solder mask was not needed for small quantity runs, especially at a time when the smallest distance between component leads (i.e., pitch) was 1/10 inch for DIPs. Here is a rundown on some of the PC kits that are readily available for use by small laboratories or in the workshop. The author has been associated with various satellite programs utilizing the Agena vehicle since joining Lockheed Missiles and Space Company in 1963. Areas of responsibility have included guidance and control, communications and command, and electrical power systems. He was previously employed by Montronics Inc., now a subsidiary of John Fluke Mfg. 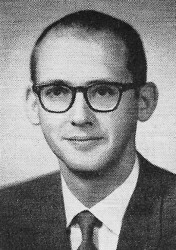 Co., while attending Montana State University (BSEE). He has written for various electronics magazines. 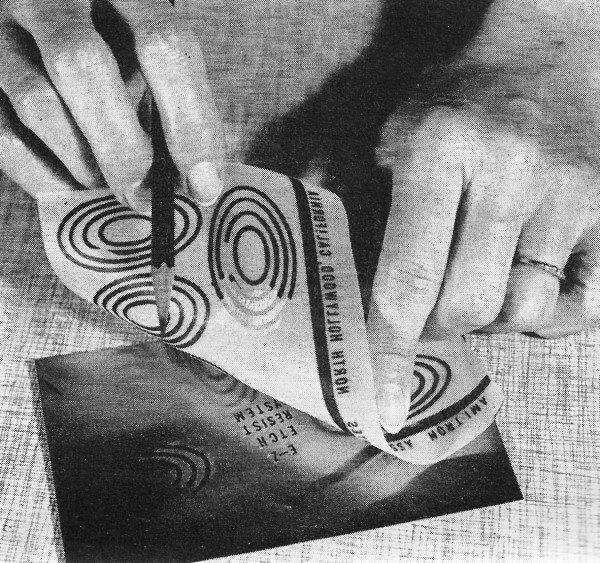 By Donald L. Steinbach / Senior Research Engineer Lockheed Missiles & Space Co.
Professional-quality etched-circuit boards may be produced in the small laboratory or in the workshop. The process is neither difficult nor particularly hazardous, and special equipment is not required. The purchase of one or more of the several inexpensive printed-circuit kits that are available affords an excellent means of becoming acquainted with the various materials and techniques. The kits contain all of the constituents (including instructions) necessary to produce a limited quantity of quality boards. The kit materials may be replenished, and the per-board cost will be reduced significantly if larger quantities of the individual items are purchased. Selecting the most appropriate kit for an intended application requires some initial familiarity with the commonly used materials and processes. Board materials, resists, and etchants may then be chosen to best suit the technical requirements or interests of the user. Copper-clad PC board material is readily available in either NEMA grade XXXP phenolic paper or grade G-10 general-purpose epoxy-glass laminates, 1/16" thick, covered uniformly on one or both sides with copper foil, 1 or 2 ounces per square foot of board material, and with or without a photosensitive resist coating. Grade XXXP is less expensive than G-10, is easier to machine, and is entirely adequate for most applications. Grade G-10 should be used, however, for high-frequency r.f. applications. The foil thickness required is a function of available conductor width and required current-carrying capacity. A 0.100" wide conductor of 1-ounce (0.00135") foil will safely carry 3 amperes, and the same width of 2-ounce foil (0.00270" thick) will carry 5 amperes. Both figures are for a 20°C maximum temperature rise. The resist is applied mechanically to an unsensitized board, or created photographically on a sensitized board. Mechanical resists are available in tape (stick-on), dry transfer (rub-on), or liquid form; the most suitable mechanical resists have an asphalt or vinyl base. The more expensive photographic process requires the preparation of a mechanical or photographic negative of the PC board layout. It is ideal when several identical boards are required, when the artwork is to be prepared on a larger format than that of the finished board, or when the ultimate in finished appearance is required. Both the dry-transfer resists and the photo-resists have a limited storage life (approximately one year). Typical example of printed-circuit kit showing all the components. The kit shown, the Techniques No. 5003, at around $10, has ample supplies for several projects. Ferric chloride or ammonium persulfate are the two most commonly used etchants. A typical ferric-chloride etchant is 34% (by weight) FeCl3 in water, although the concentration may range from approximately 28% to 42%. The mixed solution will contain a small amount of hydrochloric acid; proprietary etchants may be modified to contain up to 5% HCl. Ferric-chloride etchant has an indefinite shelf life, may be reused, and has a useful capacity of around 12 to 15 ounces of copper per gallon of solution. The etching time decreases with increasing temperature; the solution may be used from room temperature up to about 160°F. Ferric chloride attacks solder, steel, cast iron, and many other metals. Typical ammonium-persulfate etchants contain about two pounds of ammonium persulfate per gallon of water. A mercuric-chloride (1 ml of 27 g/l solution per gallon) or sulphuric acid (60 ml of 96% H2SO4 per gallon) catalyst is usually added. The mercuric chloride is poisonous, but the etchant should not be stored in a tightly stoppered bottle because of gas release. The ammonium-persulfate etchant has a useful capacity of about 7 ounces of copper per gallon of etchant and should be used warm (115°F typical). When the concentration of copper reaches 5 ounces per gallon, the etch temperature should be kept above 130°F. It is unstable above 150°F and should be used within a few days after mixing. Spontaneous decomposition may occur if it comes in contact with ferric chloride. Its chief advantage lies in its compatibility with most of the plated-metal resists. All traces of the etchant must be removed from the finished board. Ferric chloride, especially, has a tendency to contaminate the laminate substrate with insoluble forms of ferric oxide. The etchant can normally be removed from the board by thorough rinsing and scrubbing immediately after etching. Tape resists are simply peeled off; liquid resists, dry-transfer resists, and photoresists can be removed by scrubbing the board with an abrasive household cleanser or washing with a suitable solvent. Printed-circuit kits are available from several sources and range in price from $3.49 to $42.95. Seven kits, representing five major vendors and priced under $10.00, were examined and tried by the author. They represent a comprehensive selection of board materials, foil configurations, resists and etchants. In addition to the seven PC board kits, two special kits designed for the production of photographic artwork and contact negatives are included in the brief summary that follows. Editor's Note: There are many other PC kits available for use for short runs or in the workshop. However, we are including the following as representative examples of those kits that are most readily available from the larger electronics parts dealers. Amidon Associates (12033 Otsego Street, North Hollywood, Calif. 91607). E-Z Etch Printed-Circuit Kit No. 246-D ($5.95) contains dry-transfer resist. 48 square inches (2 pieces) of 1/16" epoxy fiber glass board clad on one side with 2-ounce copper foil, and dry ammonium-persulfate etchant crystals. A single-board kit is available at a corresponding reduction in price. The small pads and narrow conductor strips included in this kit will be of particular interest to IC users. The dry-transfer resists are applied easily and rapidly. The ones shown being used here are from Amidon Association. The complete line of Amidon products may be obtained from Amidon, or from World Radio Laboratories. Many of the local Lafayette Radio Electronics stores stock the printed-circuit kits. Injectorall Electronics Corp. (4 North Rd., Great Neck, N. Y. 11024). Printed-Circuit Kit No. 500 ($5.95) consists of 2 3" x 4 1/2" 1/16" XXXP phenolic boards clad on one side, a resist-ink pen, resist-ink solvent, a 6-oz bottle of ferric-chloride etchant, a 1/16" drill bit, and a 5" x 7" x 2" plastic case in which the boards are etched and the kit is packaged. Kit is available from Lafayette Radio Electronics and other parts dealers. Kepro Circuit Systems, Inc. (3630 Scarlet Oak Blvd., St. Louis, Missouri 63122). Standard Kit No. S-101A ($3.95) contains both liquid and tape resists, 54 square inches (3 pieces) of plain and perforated 1/16" XXXP phenolic board clad on one side with 1-ounce copper foil. and liquid ferric-chloride etchant. Professional Kit No. P-101A ($5.85) utilizes the photographic process. It contains 45 square inches (3 pieces) of 1/16" XXXP phenolic board clad on one side with 1-ounce presensitized copper foil mechanical negative material, photoresist developer, and liquid ferric-chloride etchant. Both kits are available with G-10 glass epoxy boards instead of phenolic boards at a corresponding increase in price. Photo Layout Kit No. PL-2A ($3.95) is designed for making photographic artwork layouts for contact or photographically reduced negatives. It contains mechanical negative material, clear acetate film, and pressure-sensitive tapes, pads, and letters. Photo-Reversing Kit No. FK-701 ($7.20) is a unique kit for producing high-contrast line negatives from inked or taped artwork. The artwork is contact-exposed on the film provided (480 square inches total) and developed with the developer supplied. Kepro products may be obtained from Allied Electronics, Newark Electronics Corporation, and Burstein-Applebee. Techniques, Inc. (235 Jackson Street, Englewood, New Jersey 07631). 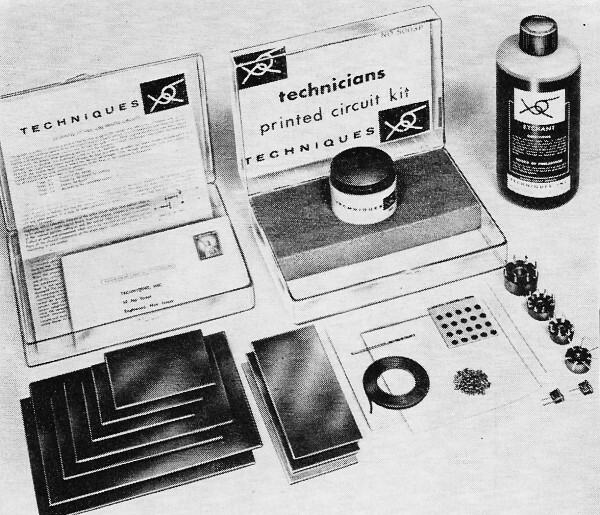 Experimenters Printed Circuit Kit No. 5002 ($4.75) contains tape resist, 72 square inches (6 pieces) of 1/16" XXXP phenolic board clad on one and both sides with 1-ounce copper foil, and the liquid ferric-chloride etchant. Technicians Printed Circuit Kit No. 5008 ($9.75) is an enlarged version of the 5002 kit, containing both tape and liquid resists, 128 square inches (10 pieces) of board material, and proportionately larger amounts of the other supplies. Techniques products may be obtained from Lafayette Radio Electronics. Do not order small quantities of material directly from Techniques in Englewood. Vector Electronic Company, Inc. (12460 Gladstone Ave., Sylmar, Calif. 91342). Etched Circuit Kit No. 27XA ($6.50) contains dry-transfer resist, approximately 80 square inches (4 pieces) of plain and prepunched XXXP phenolic board clad on one side with 2-ounce copper foil, and dry ammonium-persulfate etchant crystals. Vector products may be obtained from Allied Electronics, Newark Electronics Corporation, or Lafayette Radio Electronics. The prospective PC board user would do well to obtain catalogues from the listed vendors and examine the other products they have to offer.